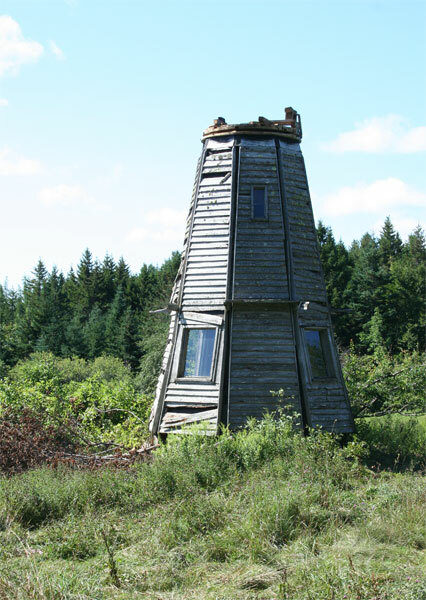 I wrote last March of a beautiful old windmill we passed on our trips to Green Bay and Broad Cove. 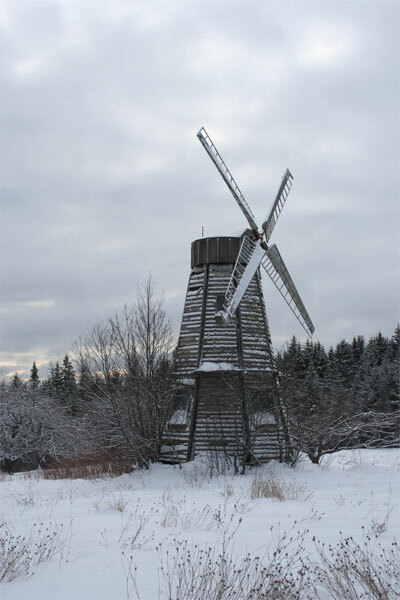 I wondered then, if it had been used to pump water to the farm, but the son of the builder commented and informed me it was used to produce electricity. 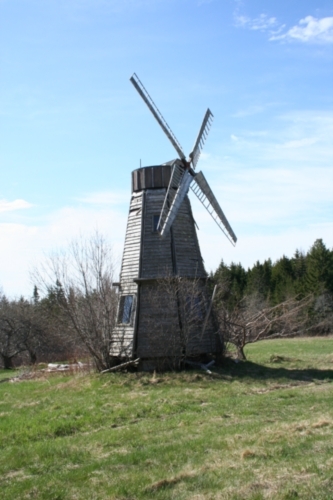 Another comment was from Lester Robinson, with the news that the windmill had been bought by the Hamachi Group, and would be moving to Beaver River, near Yarmouth, in Nova Scotia. 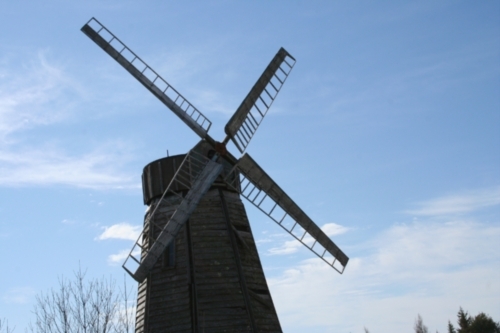 There it would be restored and become an information centre for the wind farm and eco centre. 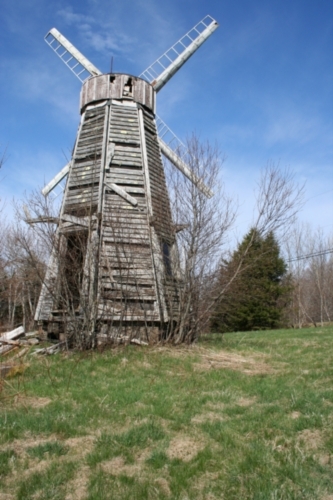 When I travelled the Petite-Riviere road in the summer, I saw that the blades and top part of the windmill had gone. 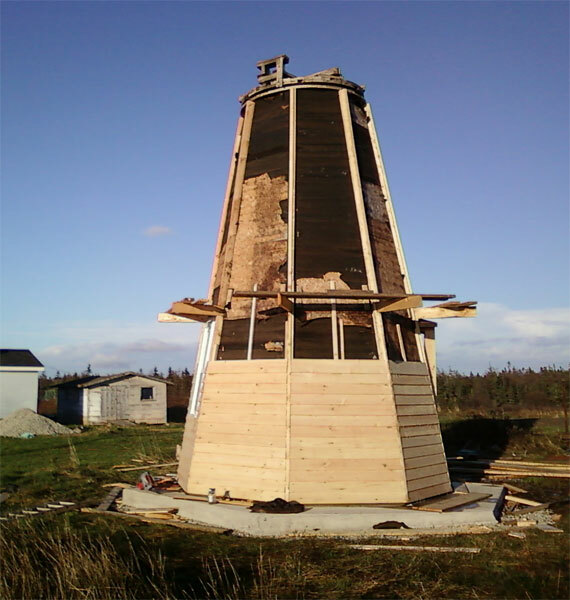 And the old windmill didn’t look quite so grand. 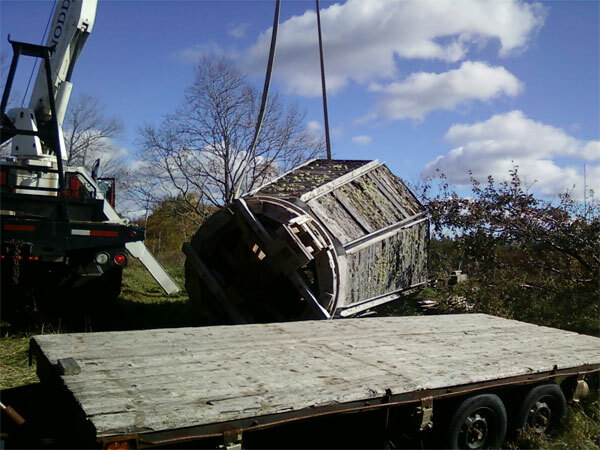 Lester has sent me some recent photos of the windmill, showing its removal from the original site. 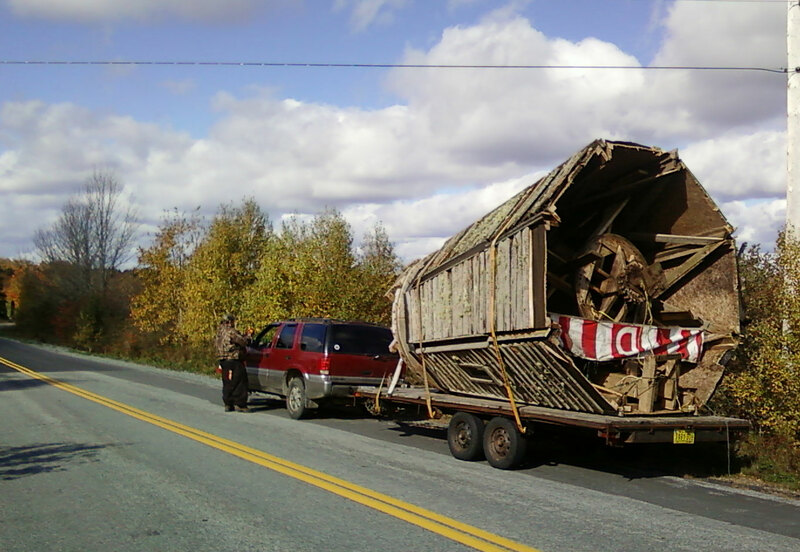 Its exciting journey down the highway. 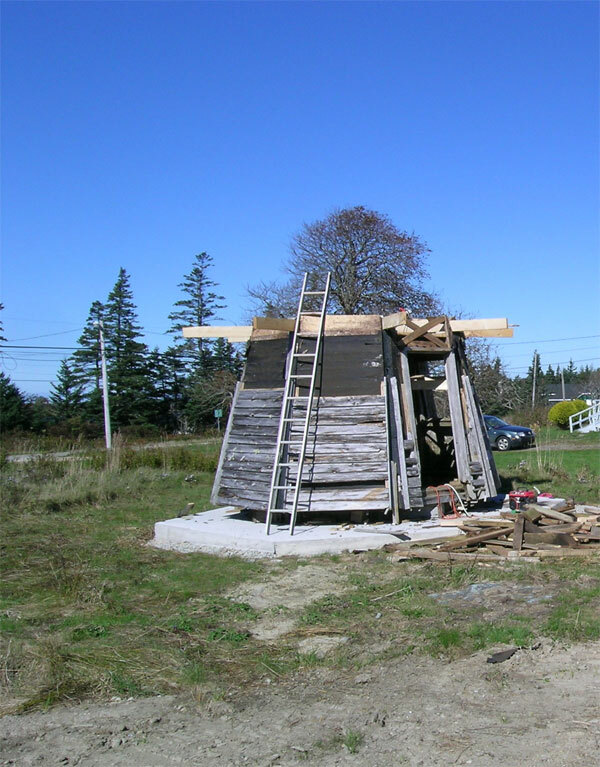 And the start of its reconstruction at Beaver river. I’m sure everything will be done to restore this lovely old building and give it a useful life once more. 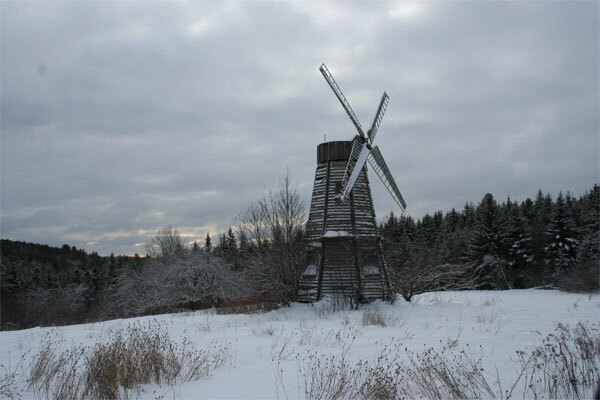 Hopefully, I’ll be able to write more, with photos of the restored windmill and the wind farm. So, when we’re out and about, I like to take photos of some of the oldest buildings I see. 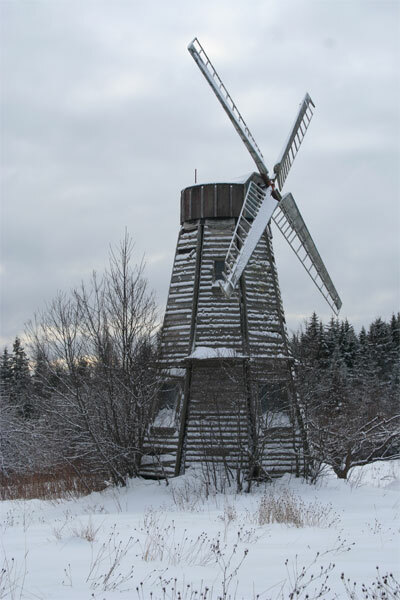 We pass this old windmill frequently, on our way to Green Bay and Broad cove. These photos were taken just a few weeks ago, as I couldn’t find the ones I took last year. 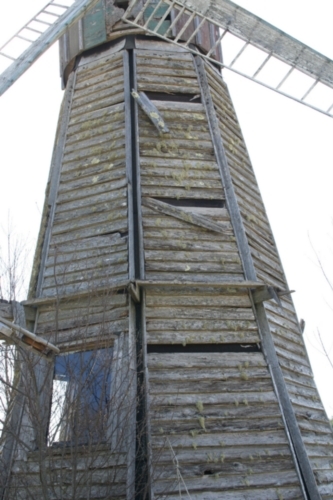 I can’t find any information about this old windmill. 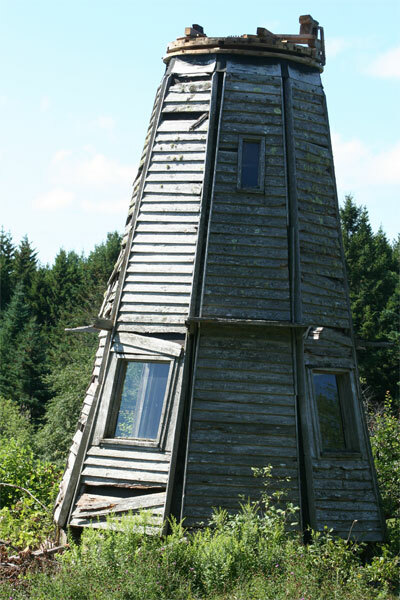 It is no longer in operation and I wonder if it was used to pump water to a tank. Perhaps someone reading this knows the answer. 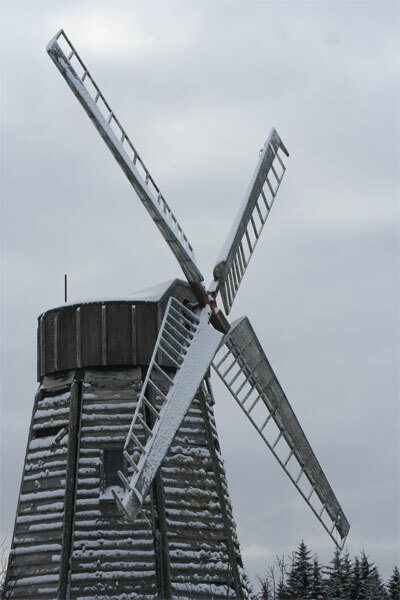 I have just found my old photos saved on Photobox, so I will add those to show the windmill minus the snow. These views were taken from the opposite side. Up close you can see how the building is needing some repairs. After a hard winter it is fantastic to see everything turning green again, and we are enjoying the colours of the cherry and apple blossom, rowan and may flower, and wild flowers. At the moment the roadside is lined with wild stock, soon it will be the lupins and white roses. There are no big plantings along the Highways by the local authority, just natural wild flowers. People are working in their gardens and garden centres are great businesses to have for the next few months. There are so many ponds and lakes around that water lilies are a common sight. We saw these yellow pond lilies at Broad Cove on one of the little ponds at the beach. These ponds are also protected places for turtles and the turtles have been given their own spots to sun bathe. I don’t know what type of turtle these are. I don’t think they are Blanding turtle as they are extremely rare. I think they might be the Eastern Painted turtle as that is the most common turtle in Nova Scotia. I have just read that they are found in plant-filled ponds, lakes and streams and are often seen in groups basking on logs and rocks. They seem to be most common where lily pads and pickerel weed grow, eating insects, snails and bits of lily pad. So it sounds like them. Got up this morning to find my potted begonias, under where the bird feeder usually hangs (we bring it in at night), had all been pulled or dug out and were lying in a heap of soil on the deck. We think the squirrel came to eat and was angry at the lack of seed and took it out on the plants. Although, I have just been reading that squirrels do eat young garden plants and vegetables. So I now have to think up a solution to save all my other planters on the deck. If anyone has any ideas, let me know.